ScanDir version 1.3.3 supports Microsoft Windows® Vista, 7, 8 and 10 (x86 and x64 architecture). See: Installation for more information. Known problems	will be reported here: Help/Problems. The first release of ScanDir printed a list of images on a CD-ROM. All it could do was select all files with a .jpg extension. With the next version one could select more images, such as files with a .gif or .bmp extension. Over time additional filter options have been added, like Mask, String, file-size, file-date and file-type. Where the early versions could only print the selected file names, later versions of ScanDir could also Rename, Copy, Move or Delete the selected files. The current version of ScanDir has even more filter options and supports Regular Expressions as a search argument. When I started developing ScanDir (which stands for: Scan Directory) the word "directory" was the common term used to indicate a folder, whereas today the term folder is used more often. So whenever you read the word "Directory", it means the same as what many people today would call a "Folder". To start with, select the drive and folder where you would like to begin a search. Next specify one or more search arguments, indicate whether or not to include sub-directories and hit the [SCAN] button. The results of the Scan (search) are displayed as a list of file- and/or folder names (item list). All (or selected) files and folders in this list can be Renamed, Copied, Moved, Deleted, Saved (exported) or the list can be Printed. 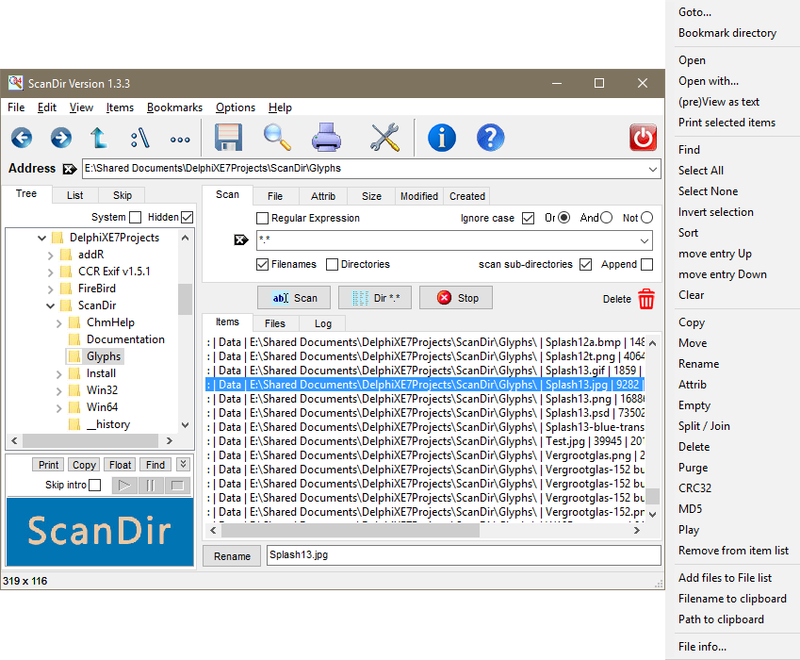 The latest additions to ScanDir include the ability to (pre)View text- and image files, Play media files, Open (run) program files and generate a CRC32 or MD5 checksum for selected files. CRC32 and MD5 checksums can also be used during rename, saved as a text file or copied to the clipboard. Right-click in the item list to view all available options. The Rename function includes automatic numbering of files and folders, extend filenames with one or more path-name levels, add a date stamp, extend or truncate filenames, add, change or remove extensions and supports multiple ways to modify the text case. The Rename function can also be used to generate Bates numbers for a range of files. A limited Rename funtion is available in the Copy and Move dialog. In addition to searching one specific directory tree, ScanDir can also process a pre-defined list of folders spanning multiple drives. Currently, this is the only way to scan multiple drives at once. A second list of directories (Skip) can be used to specify folders that should be excluded (skipped) during a scan. Download and unzip scandir133.zip to the location where you want to store ScanDir. Download and run scandir133_install.exe to install the new version of ScanDir. Depending on the PC architecture (x86 or x64), the 32-bit or the 64-bit version will be installed.